UPDATE: It's worth taking a moment to acknowledge the long-sought triumph Lang Sias' appointment to the Colorado House represents for his high ranking GOP kingpin supporters, who have been trying to get Sias into office–any office–for several years. 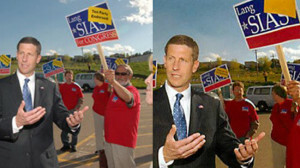 Sias lost the 2010 7th Congressional District primary to Ryan Frazier, who went on to be pummeled by Ed Perlmutter. Sias then lost two successive bid for an Arvada state senate seat, one to Democrat Evie Hudak and the other last year to now highly targeted Sen. Laura Waters Woods. One consequence of Sias' appointment to HD-27 is that Waters Woods is now operating without a net–if she melts down at the Capitol as many expect before going up again for election in 2016, Sias is already busy holding down this House seat. 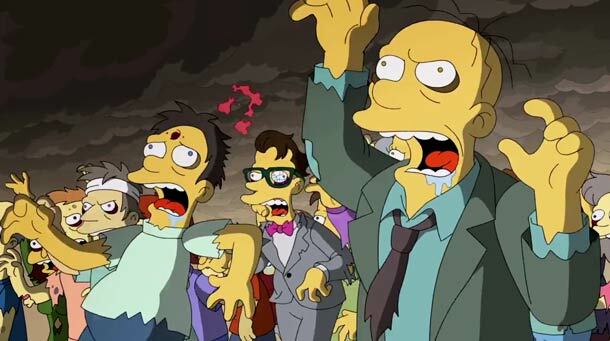 But for today, it's enough to celebrate along with what's affectionately known in some circles as the "Sias Zombies." After years of rejection by the voters, they've finally found a way to get Lang Sias into the club. Lang Sias (before and after). Former Top Gun pilot Lang Sias has finally won an election after a vacancy committee on Saturday elected him to former Rep. Libby Szabo's seat in the state House. "I'm very excited and humbled — and hoping to stay that way," he said. The 14-member committee selected Sias over mortgage banker Christine Jensen. The vote count was not announced. Congratulations Rep. Sias, and may all your elections be decided by fourteen voters. As long as Larry doesn't try to run again in SD 20; or move to HD 23 to run……………..
Wow, 14 member vacancy committee? The R's don't allow all of a district's PCPs to participate? Who are these select and chosen people? Frank….most likely the bylaws of HD27 organizing document spells out vacancy selection. Often done via an annually or bi-annually selected vacancy committee. I believe some district organizing documents call for a vacancy committee to be the "committee of the whole". Whichever the case, its is likely chosen and open to change by the people who are involved and at the organizing meeting. >> That's unlikely, of course. He is a vast improvement over Christo-fascist Libby Szabo, but not an improvement over the option of leaving the seat vacant…. They're on to something. Why spend all that money on elections when you can just hand off seats in a endless round robin? Of course you can't eliminate all elections but every little bit helps. Just pick one strong candidate (Faye Griffin could be elected God in JeffCo), and have her run for everything. Then let the party appoint to all of the jobs she doesn't want this time round. Isn't that pretty much what they are doing? Who is going to replace Lang Sias the RINO primpary challenger to Laura Waters Woods next year? Can Mario Nicolais move into her district?